Home Gratitude What Are Your Priorities? Nobody likes that question; especially when they’re on the verge of buying something awesome and/or ridiculously expensive. I don’t have ANYTHING against money. 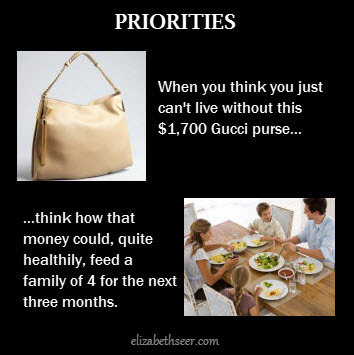 I enjoy it as a matter of fact, but when I found myself looking at an email ad for a Gucci bag at half-off for a price that could feed a family for 2 months, I had to stop and think. Is this genuine leather purse, with the tight stitching, large enough to hold a few of my “important things” when I leave my home, THAT important for someone to own? Eat well. Drink well. Live well. Help others do the same with the leftovers. I’m not saying give it to the lazy people who simply can’t pull themselves off the couch, or away from their addictions, to work. If you must have that purse, and you have the money for it, great. Just remember to show your gratitude for the opportunity to buy it while others are simply worrying about how they will feed their family. altruism, feeding a family, helping others, priorities, social change, spending money, things you don't really need. Bookmark.